Largehearted Boy: Book Notes - Matt Bell "Scrapper"
Book Notes - Matt Bell "Scrapper"
Matt Bell's novel Scrapperis a haunting, poetic, and dark tale of love and redemption. 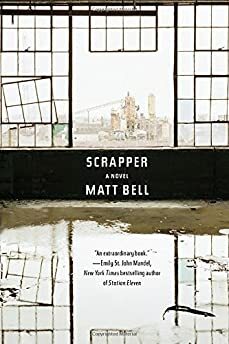 "Equal parts dystopian novel, psychological thriller, and literary fiction, [Scrapper] evokes a dark and lonely existence for its stoic protagonist... By the novel's end, Bell adeptly depicts Kelly as a complicated soul capable of great violence and kindness." Scrapper revolves around a foiled kidnapping in Detroit, and every so often I'd think of this song, with its story of a long-past kidnapping/abuse (like most songs the details are a little fuzzy), and especially its angry (but ultimately impotent) narrator wanting the victim to stay inside the story of that event, to seek revenge for what happened to her. All he has to offer is a violence of his own—"If I could tear his throat, and spill his blood between my jaws, and erase his name out for good, don't you know that I would? "—but the song refuses him this, because its not his trauma, not his experience to erase or fix. Hurry Up, We're Dreaming by M83 was the album I was listening to the day I started Scrapper, and so it also became the album I returned to not just throughout but obsessively anytime I thought I was finishing a draft. Its mood isn't necessarily very reflective of my novel's, but there's a cinematic and expansive feel to M83's best songs that fits well with my own wants to create a larger than life experience, to have the words on the page suggest a bigger world than just the one story in front of the reader. Not a single scene of Scrapper takes place in the town where Kelly, the protagonist, was born, but what happened to him there colors everything he's done and felt since leaving there, years and years before the book begins. That kind of long tail effect—a sort of combination of regret and nostalgia—is what I think I hear in this song off my favorite album from 2013, released when I was in the thick of the writing: "How I asked you / Where you want to be buried / And you asked me the name / Of the town where I was born." I often can't listen to lyric-driven albums when I'm writing, not because they interfere but because I can't pay very close attention to what for me is the best part of the music. But Sun Kil Moon's Benji, which came out during the time I was working on the final drafts of the novel, fought into the writing day's playlist and stayed until I was done. The writing here is just so good, the emotion's so honestly rendered. I also appreciated the way this album felt so tied to its landscapes. I'm not sure I even think that much about a song's "setting," ordinarily, but the small details of place in these stories drive so much of their effect, another good reminder to have during the writing day. All three of Lykke Li's albums were on constant repeat while I was writing this novel and so much other work I've done in recent years. Sometimes, all I need for a song to stay in the rotation is for it to reach for maximum emotion, and Lykke Li's voice moves me like almost no one else's. This song is one of my favorites of hers, in part because it's otherwise so minimal: the music supports her voice, but I think the song would be just as powerful without it. If I can fill a phrase end to end with emotion the way her voice can, I'm a happy writer. Movie soundtracks are some of my favorite writing listens, because the music is usually instrumental and geared toward the cinematic. I listened to Cliff Martinez's soundtrack to Nicolas Winding Refn's Only God Forgives over and over while writing Scrapper, in part because its such a stirring yet discordant score, and in part because it reminded me of the movie itself, which came out after I was a draft or two into my book. Ryan Gosling's Julian is a very different character than my Kelly, but there are some similarities: Julian is a muay thai fighter, Kelly an ex-wrestler and a boxer, but both men use violence to paper over a number of weaknesses and traumas, and both of their stories expose those weaknesses in increasingly dramatic ways. The bravado of this song's title—"Wanna Fight? "—reminds me always of the kind of cowardice that hid inside Julian, even as he seemingly seeks and inflicts violence throughout the film. "The courage of the coward / is greater than any other." Listening to this again, one of my favorite songs by one of my favorite musicians, it occurs to me that this line could have been an epigraph for Scrapper, if I'd thought of it in time. Chesnutt's talking about a different kind of violence than what pervades my novel, but I think the results come from similar places: "Courage born of despair and impotence," he writes, a sentiment that Kelly might not be able to express but certainly both observes in others and feels himself throughout the novel. This one's also a constant of my writing life, both while I was writing Scrapper and now going forward: It's a pretty rare week at the desk that doesn't see at least one appearance by Swans. The Seer continues to be my favorite of their albums, and this song my favorite on it. When I was working on my last novel, I listened to Ben Frost's By The Throat over and over, as a sort of sonic guide to the depth of feeling I wanted the music of the prose to have. I think this novel I went to The Seer more often, listening to it loud on headphones, trying to think about the acoustics of language and how far they could be pushed, just as Swans constantly pushes what I think is possible in music. I'm not saying I've succeeded as they have, but their example certain helped me try.